You want to make money without doing anything. I’m not surprised – so do I! Passive income is an easy way of making money (because it requires very little work on behalf of the earner – hence the term “passive” – duh). There are many ways of making passive income, but coming up with passive income ideas can be difficult for one reason: mental blocks. Mental blocks may include lack of knowledge, the idea that the topic seems complicated, and risk adversity. In reality, you just need to take the plunge. I make passive income in a few ways, and because of my efforts to make passive income and always come up with plans to create MORE, I have been able to make upwards of $900/month in passive income. Here are a few ways that I make passive income, as well as some popular methods that others use. This passive income idea is probably one of the more controversial ways of investing, however, it is effective and a feasible passive income stream. What peer-to-peer lending entails is just as it sounds – you are lending money to a peer (or an individual/group of individuals) and acting as the lender, instead of a bank or credit union. There are many reasons why somebody might opt to be funded by a peer instead of a bank, but this should be taken as an opportunity to make money. Banks make a TON of money from lending – whether that’s through credit cards, business loans, or personal loans – and you can cash in, too. One way many people do this is by signing up for a P2P lending platform. Probably the most popular lending platform is LendingClub.com which will connect you as a lender to borrowers, and as a borrower to lenders, and make it all possible. Thousandaire.com has a pretty good write-up of how much money you can make from Lending club. Investing is one of the most successful methods of making passive income, and one of the best passive income ideas out there. If you do your research and invest intelligently, you can make a substantial amount of money in interest, dividends or bond coupon payments. The average historical return when it comes to investing is around 9-10%, which is 9-10% return on truly passive income. There are many ways to start investing, but the best way to do it is to just START. Don’t procrastinate. Start by learning about investing. Some great classic books starter books are Stock Investing For Dummies and The Bogleheads’ Guide to Investing . Finally don’t get stuck in analysis paralysis, just get started. You can always start with some small investing positions. Blogging is, in and of itself, not passive. You have to write articles, comment on other posts, format, learn search engine optimization, have a presence on social media, etc. Even so, if you are a hobby blogger and are already blogging, you can monetize your blog by adding Google Adsense or affiliate marketing. Many bloggers make a lot of money through these channels. If you make enough to outsource the work and still make a profit, then it truly becomes passive. Blogging is also really fun, so that’s a huge bonus when it comes to earning passive income. While this isn’t 100% passive (though nothing really is), many people make money by becoming a landlord. I say this isn’t completely passive because you are at the beck and call of broken appliances, rowdy tenants and the whims of the market. You can either purchase an income property (be careful with this one), rent out a room in your house, or convert a floor or separate building on your property into a suite. We have had success with this one, and because we have a family member in our basement suite, it truly is passive. All we have to do is collect the money from him every month. As you can see, creating a passive income stream is not difficult, you just have to get started. What are your passive income ideas? Great! Let me know how it turns out – maybe in a guest post? I was looking into P2P lending the other day but it’s still US dominated – there are one or two sites launching in NZ soon but they’re not live yet. P2P lending is very much US dominated. Will you be taking part when it launches in NZ? I currently am a landlord, blog and invest a majority of my income so those are my sources of passive income. I am working at building up enough money for purchasing another rental unit as well. That’s great. Where are your investments? Which is your favorite source of passive income? I really gotta get to monetizing my blog – I’m just a little overwhelmed on where to start! Let me know if you need some guidance Kali! Lots of juicy ideas to tuck into here. I think I’ll look into peer to peer lending. I knew nothing about it before I stopped here. Thanks! It’s a pretty promising way of earning passive income. The returns can be pretty good, you just have to be careful in who you lend to. I’ve got the first two covered, and need to jump in on the 4th – Peer to Peer lending. It’s vital for many people to focus on multiple streams of income! Are you planning on starting P2P soon? Well I have 3 out of the 4 currently working for me. My peer-to-peer account is going to be stagnant for a while because I want to let the account mature to get a clearer sense of the returns. It doesn’t make much sense to plow money there if I can get an equal return with index funds which are more diversified and carry less risk. My blog isn’t quite taking in much yet (still in the red when you factor in hosting costs) but I figure it just needs time to grow. You definitely need to leave your blog some time to grow to actually start seeing some good returns, but if you want to get into the not so passive side of things, I would suggest learning about affiliate income and optimizing your posts as much as possible to take advantage of this type of income! I think these are all great ways to earn passive income. Husband and I are looking into #4 at the moment and have just started working on #3. I’m curious what you mean by ‘optimizing’ posts. I’m new to blogging and as someone mentioned above, it really is a little overwhelming when you first start. Yep! 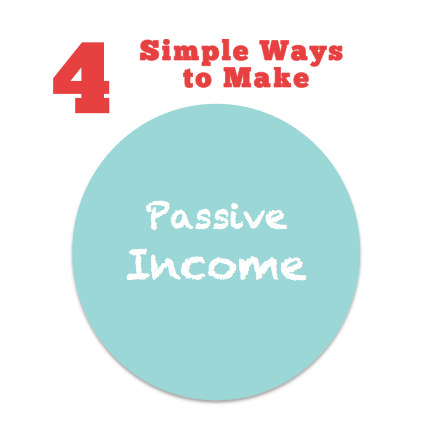 All great ways to get passive income. I really want to get more into investing. I better earn a bit more so I can funnel cash towards that goal! The best way to do it, in my opinion, is to put all of your passive income toward making more passive income. It snowballs! All of those are great sources of income. P2P lending is by far the most passive of the group. Buying a rental property and becoming a landlord is one of my goals for the next year or so. Hopefully I can make that happen sooner rather than later. It’s the most passive, definitely, as far as passive goes – you still have to do a lot of research to make it profitable though. Peer to peer lending was one of my financial goals for the year. I’ve finally chosen and invested in some notes in Lending Club, so hopefully it will go well for some passive income! I would like to own a rental property at some point but I’m not ready for it just yet. Owning rental properties can be a great way to make passive income but it also takes a LOT of capital up front. I would love to expand my passive income from soley investments to blog income as well! That’s a good goal. Let me know if you have any questions re: making money blogging! I’m trying to monetize my blog, but it’s not quite where I want it to be! Does AdSense really make bloggers any money? I heard that it’s not really worth it. It depends on the niche and your traffic. The higher the traffic the higher the income, provided that you’re putting your adsense in the right spots on your blog. Let me know if you have any questions or need any help re: monetization. Nice list… currently I am focusing on 1 and 2, but hopefully I’ll be able to try out #3 and #4 someday! I bet on your ideas in investing and monetizing a blog. I’ve been through this experience and I’m glad to say that it works! I recommend others to try it too. One thing for sure you’ll gonna love the results :). All good points but perhaps becoming a landlord is out of the reach of most until much later in life. The Internet has leveled the playing field and blogging and investing online is certainly a lot easier these days than in years past. I have never done P2P lending though I see it as a income source from quite a few bloggers out there. Hi, does it costs much to start blogging? What are the skills needed?